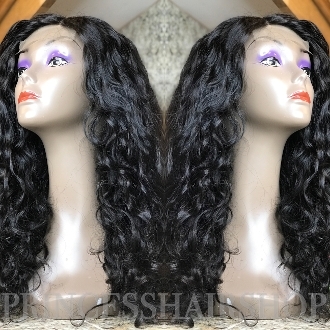 Our Products >> Armenian Exotic Wave Custom Wig 18"
Mesh Dome Cap Fits Head Circumference 23.5-24.5 with medium to thick natural hair base Front to Nape 14.5. Fits a traditional size medium. Made from Princess Hair Shop CUSTOM WEFFTED HAIR EXTENSIONS Unit is freestyle part lace closure. Knots are not bleached or plucked. 100% Authentic Lots of body, versatility, bounce, resilience and durability Medium density/Low to Medium luster medium coarse/thick in texture Ability to straighten & hold curls extremely well Minimal shedding/Customized wefting/Minimal tangling Virgin State Unprocessed Uncolored Armenian Exotic Wavy Hair 18"
Armenian Exotic Wave Custom Wig 18"